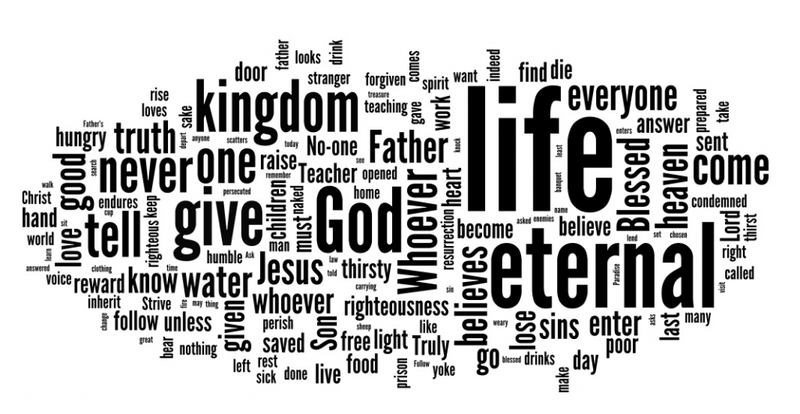 This 'tag cloud' is a picture of the Top 50 Texts listed in The 360 Gospel of Jesus, produced by www.wordle.net. The largest words are those used most often. It is more of a discussion starter than scientific tool. What impression does this give of the Gospel? What are the most common words? What is suggested by many words being of similar size? Are there any words you are surprised to see small? How might this help you in sharing the '360 Gospel of Jesus'? Click here for a handout for group discussion. - as it appears in The 360 Gospel of Jesus (Grovebooks) and below. Barry Hill from Leicester says he was inspired by the Jesus 360 'wordle' and wondered what the tag cloud would look like for the whole text of all four Gospels. He was interested to see how this then compared with the Church of England worship book - an interesting exercise you can see here.